5 biggest differences in Hollywood and Bollywood. These are the 5 biggest differences in Hollywood and Bollywood, do you know? 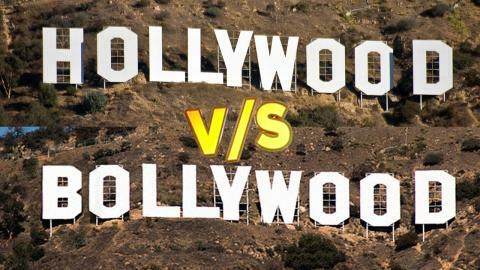 Hollywood and Bollywood - Today we will tell you 5 different differences between the world's two biggest industry, due to which there is a difference between land skies. Actually, we are talking about the world's number one Hollywood and number two Bollywood industry, where Bollywood makes romantic masala drama films, on the other hand, technology and logical films are made in Hollywood. Bollywood has taken the name from Hollywood, but till date, she has not been able to make any progress in it. Following are the hidden reasons that we have brought to you today. Where Hollywood started with a silent film in Old California in 1903, on the other hand, Bollywood had released its first film, Raja Harishchandra in 1913. Although there is not much difference in the beginning of both, Hollywood has started promoting itself since its inception, whereas it takes about 20 to 30 years for Bollywood to make their place among the people. The latest technology has been used in Hollywood since the beginning, and even today the world's best technology is only with Hollywood. Whereas Bollywood is making films with love, romance and comedy on one side, there is no limit on Hollywood's content. You might be surprised to know, but in Bollywood, many movies are produced more than Hollywood every year, but still Hollywood gets beaten in terms of earnings. This is because Hollywood movies are seen in the entire world and are at the forefront. The more Hollywood films have a movie budget, the more they earn 1 Hollywood. We all know that the quality and storyline is much better than BollywoodFilmos in BollywoodFilmom. Hollywood always creates movies on new topics. There are about 99 percent of FilmyOriginal in Hollywood, there is neither a copy of any other movie nor is it based on anyone. On the other hand, Bollywood always makes films based on the same old songs and old stories. You must have seen that nowadays Bollywood's music is copied to the movies. Bollywood is ahead of Hollywood in this subject. Whereas you will not get to see songs in Hollywood movies on one side, in every Bollywood movie you will definitely get 5 to 6 songs. Even today, his songs are being liked more than Bollywood movies. It is believed that it is necessary to have an item song in it to hit a Bollywood movie. Hollywood, on the other hand, uses only background music and its different albums are preferred more than movies. This is the difference between Hollywood and Bollywood - because of these reasons, Hollywood is still the world's number one industry.